It looks like something straight out of a Star Wars sequel. 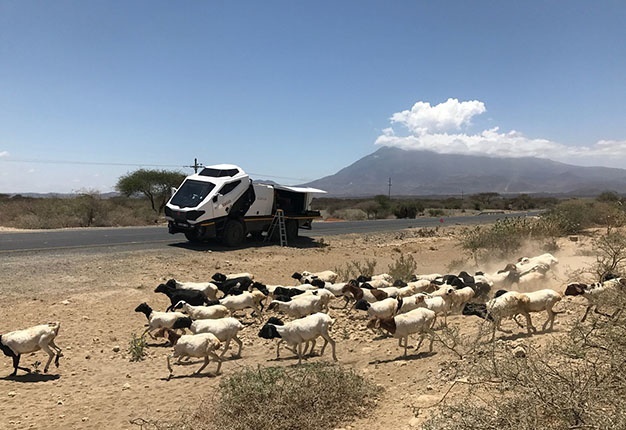 But, reports Ferdi de Vos, this peculiar looking, outlandish truck, designed and built in South Africa, is completely road legal and has already covered over 20 000 km on a road odyssey halfway around the world. It was his fondness for science fiction, an entrepreneurial spirit, his conviction that if you can think it, you can do it, and his appetite for adventure that inspired Nour Addine Ayyoub to create the ultimate road trip machine. 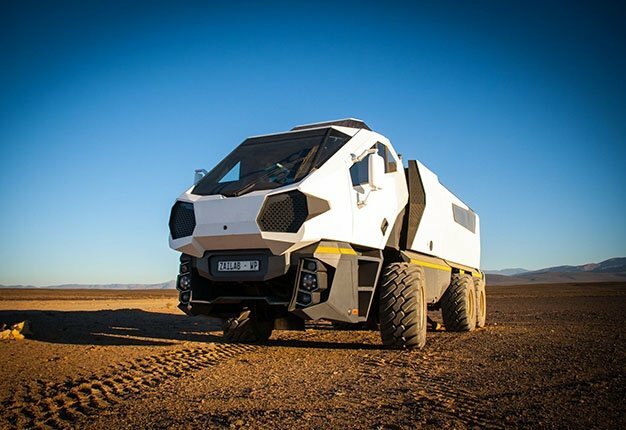 The space truck with its futuristic, outlandish body, inspired by sci-fi movies such as Tron, 2001: A Space Odyssey and Star Wars, is based on an 18-ton 6x6 MAN KAT chassis – like the vehicles used by backup crews in the Dakar Rally – and powered by a Magirus Deutz V10 engine. 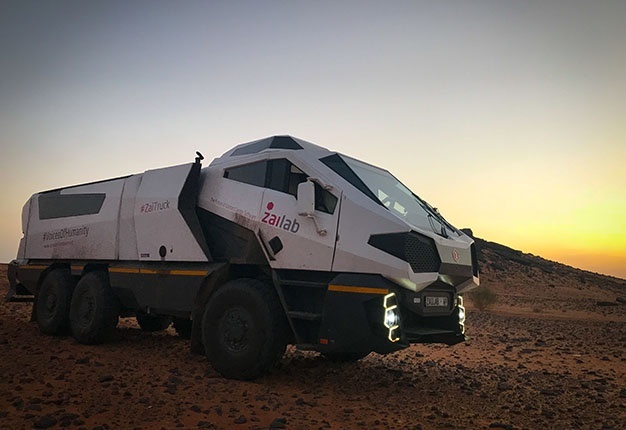 Ayyoub, head of the software house ZaiLab specialising in contact-centre solutions, once bought the six-wheeler with a vague intention of converting it into a super camper to drive from Cape Town to Morocco for a holiday. But then he had a better idea. Why not use the truck to partner with his humanitarian project, Voices of Humanity, which aims to record the lived experience of a wide spectrum of people? The intention, at least initially, was to spread the message of rewarding conversations across the continent. But he needed a conversation starter. 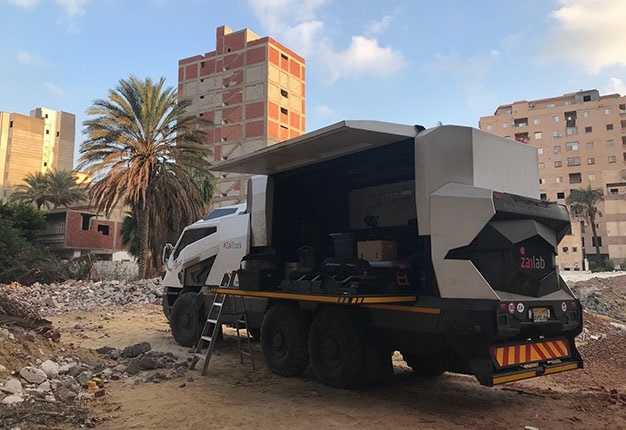 So, in 2016 he tasked his design team under the leadership of SA educated industrial designer Roelf Mulder to build a futuristic space truck that can travel from Cape Town to Cairo. The ZaiTruck, named after his company, was born. “At first sight, this expedition makes very little sense. In a rational world, there is no reason for a fantasy space truck to exist, let alone go driving through Africa,” he said. But the machine is not just an all-terrain, all-purpose road runner, oh no, it is a fully functional mobile laboratory, studio, and office. 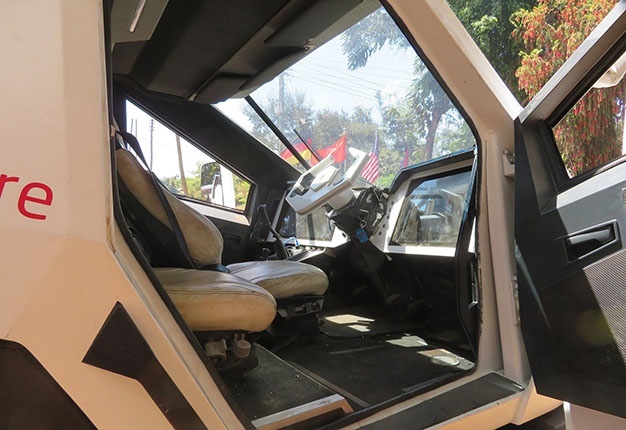 It is packed with the functionality of a Recreational Vehicle (RV) and interesting features you’d most likely see on specialist vehicles at SEMA in the US, such as hydraulic cylinders to open the front cockpit, lift the rear ceiling, and open all the capsule doors. The capsule roof lifts over 75mm, the side panels open upward to form a canopy, and the lower portions of the side panels extend downward to form a floor. The truck is fitted with a 1 000-litre diesel tank, a fully furnished kitchen, 65-litre fresh water and grey water tanks and a full media centre with LCD screen, connected computers and a sound system. 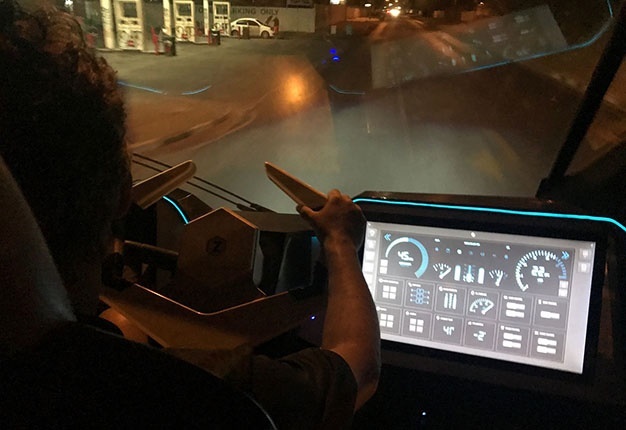 Visibility for the centrally seated driver behind the weird-looking steering wheel is provided by four cameras and their images are displayed on two 22-inch touch monitors to his left and right. The instrument panel is fully digital and features custom software, and four 125W solar panels provide power to a 4-kWh deep-cycle battery. The expedition, including Ayyoub and ZaiLab staff members Dominique Vandenhoudt (videographer) and Mulder, set off from Cape Town in September last year. Initially, the aim was to travel to Egypt, all the while chronicling the experiences of a wide spectrum of people, building bridges and forging understanding as part of the Voices of Humanity project. Counterintuitively, the truck’s conspicuousness and strange appearance helped to smooth their passage across Africa; notorious for its tricky border posts and roadblocks. It attracted interest and piqued people’s interest everywhere. The truck was built to survive the toughest terrain, and this has come in handy in its great trek across the continent – through South Africa, Namibia, Zambia, Tanzania and Kenya. It was not without challenges, with electronic failure, flat tyres and potholes causing trouble along the way. But it did not stop the team from climbing Mount Kilimanjaro in early October, before continuing to Sudan, Ethiopia and Egypt. Having achieved their first objective, the team decided to continue their mission, driving through Italy and from there to Ayyoub’s birthplace of Antwerp in Belgium. Still, it wasn’t enough, and the journey was extended again. The ZaiTruck was shipped to New York in the United States and then went to Orlando in Florida where the team visited the Enterprise Connect Expo in March this year. From there they undertook a 3,000 km road trip to Las Vegas – in time for the Customer Contact Week (CCW) convention in June. Besides serving as a vehicle for Ayyoub’s humanitarian organization to promote human rights and freedoms throughout its journey, the ZaiTruck has now also become a larger-than-life marketing billboard for ZaiLab, demonstrating the company’s software at expos and conventions worldwide. Hy believes static contact centres are a dying trend and that cloud-based solutions are the future. With the ZaiTruck a contact centre can be operated anywhere, anytime. And still, the end is not in sight. Ayyoub is continuing the journey, and after attending the CCW Vegas in June, visited Area 51 (sort of) before joining the Burning Man festival in the Nevada Desert at the end of August. And what has he found on his trip so far? Well, according to Ayyoub, people everywhere all think the same…The odyssey continues.